The domestic demand situation is benign, supported by economic growth and increased consumer sentiment. In 2017 the number of registered vehicles grew 6% year-on-year, and between January and May 2018 new car registrations increased 10% for passenger cars and 8% for light commercial vehicles. The used car market is import-driven, which adversely affects sales of new cars in Poland, but at the same time manufacturing is very much export oriented (automotive accounted for more than 16% of total Polish exports in 2017). Competition is very high in the industry with price wars and consolidation pressures, particularly visible in the car parts distribution and car dealers segments. Profit margins in the automotive sector have decreased since 2015 due to wage pressures and increased commodity prices. Margin deterioration will continue in the coming months, reinforced by the competition and consolidation pressures (especially for tire and car parts distributors) and rising R&D expenses necessary for electric vehicles. Effective logistics and IT solutions in distribution as well as proper stock management are key success factors for businesses in order to sustain their margins. Payment duration in the automotive sector is about 80 days, on average. Payment experience has been good over the past two years, and no significant increase in non-payments is expected in 2018. However, payment delays and non-payments are rising in the tire segment (due to lower sales in 2017 and higher stock levels) and from buyers in the transport sector. Automotive insolvencies are expected to rise in the coming months due to lower exports to Germany (declining demand for diesel engines) and the problems in the tire distribution segment. Our underwriting stance is generally neutral for the sector. While domestic demand continues to grow, we are aware of risks related to changes in production processes (e.g. tighter emission standards, less demand for diesel cars). Therefore we increasingly consider whether manufacturers and suppliers are bound to innovation (electric/hybrid cars) or overly dependent on diesel vehicles. 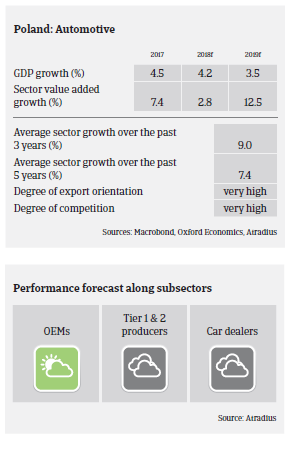 We are more cautious with smaller Tier 2 companies due to high competition in this segment and lower bargaining power. Due to the high export dependence any imposition of import tariffs by the US would have an adverse impact on the Polish automotive sector, especially for Tier 1 businesses.